We need to talk about who can build a tiny house on wheels. Are registered builders qualified to build tiny houses on wheels? What about ordinary people with no building experience? The answer might surprise you. There are risks for both these groups of people building tiny houses on wheels. For registered builders, the risk is that they would build a tiny house on wheels exactly the same way that they would build a conventional house on a fixed foundation. They might assume that they have all the knowledge they need to build a tiny house on wheels and be blind to the ways that they need to accommodate for its portability. As for DIYers, the risk is that they don’t know much about building and focus more on hearsay, or quick, achievable solutions rather than well-researched building strategies. Both DIYers and professional builders can inadvertently build a tiny house on wheels that is structurally unsound. For anyone setting out to build a tiny house on wheels, either for themselves or professionally, the one essential step that they need to undertake is research. We are living in a charmed moment in time when tiny houses on wheels are not regulated by building codes, which means that we tiny house builders need to self-regulate when it comes to safety measures in our building practices while enjoying the freedom to make great innovations in tiny house building techniques. It also means that we need to recognise and accept the responsibility that we all carry as tiny house builders. For DIY and professional builders alike, the future of the tiny house movement hinges on the safe building, transport and occupancy of all tiny houses on wheels. Just imagine the spectacular headlines if a tiny house comes off a trailer while being towed down a highway, or any situation that basically constitutes a major tiny house fail. Regulators and naysayers will jump at the opportunity to put a kibosh on all un-regulated building activities. So please be responsible in your tiny house building methods and do your due diligence on how to make your tiny house safe, strong and ready to roll. Consider the physics of a movable dwelling. Although you might have a permanent location in mind for your tiny house on wheels, it’s good practice to assume that you will have to move it someday. Or someone else will. The fact is that if it’s on wheels, someone may try to move it. So better to make it fit for travel than have to live with the consequences. During transportation, there are some strong wind pressures on a tiny house. 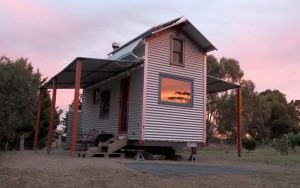 ’Storm’ is a term given by the Bureau of Meteorology for winds at speeds between 88km/hour and 102 km/hour, which is about as fast as most people will tow a tiny house down a freeway. When storm winds occur on land, the Bureau expects ‘considerable structural damage’ to buildings that have been built to meet the National Construction Code. So tiny houses on wheels need to be made exponentially stronger than conventional buildings, to be able to withstand storm winds, almost all of which will be applied to the one leading wall as the house travels down the road. In addition to this, the tiny house needs to be securely attached to the trailer, and the roof to the tiny house, to prevent against the upward lifting forces from pulling it apart. What are ‘upward lifting forces’? It’s the part of physics that makes planes fly. When an object is being propelled through the air quickly, like when a tiny house is being towed down a freeway, the air rushing over the top of it pulls it upwards. The object does not have to be shaped like a wing, it can be anything. It can be shaped like a roof, for example, which is why a roof of a normal house can be ripped off in severe weather conditions. Find out how to secure your tiny house against wind forces in our workshops. In response to these outstanding physical forces, Fred has developed a unique Unified Construction Method™ which considers all the possible ways that a tiny house on wheels can be buffered around during transport. It securely connects all the parts of the tiny house and trailer, making one unified whole. The Unified Construction Method™ is complex, far too much to explain here, but let’s just say that it goes way beyond what the minimum building code stipulates for conventional buildings. It has been designed specifically for tiny houses on wheels to be transported through high winds for the duration of it’s long life. Better yet, Fred’s Unified Construction Method™ is tried and true, as Fred’s prototype was made with this Method and has been successfully transported many times without any hint of wear or movement. To learn all about Fred’s Unified Construction Method™ in a high level of detail, you can attend one of his weekend workshop series where he explains the Method clearly, in language appropriate for people with no building experience, as well as how and why he came up with it in the first place. …and the ways that they can ruin the attachment between your tiny house and your trailer. A common practice and error at the moment among tiny house builders (professionals and DIYers alike) is to attach the tiny house to the trailer by using bugle batten screws screwed vertically through the floor and into the steel of the trailer. This is a dangerous method of attachment because the strength of the attachment relies on the thread of the bugle batten screws to hold onto 3 or 4 millimeters of steel in the trailer. 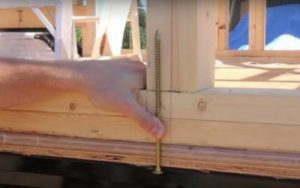 As the tiny house on wheels vibrates during transport, the screws too will vibrate and either back themselves out of the hole or widen the holes that connect them into the trailer. The screw can simply pop out unexpectedly, leaving your tiny house completely unattached to the trailer. If that sounds dangerous and scary, it is. It’s so dangerous and anyone attaching their tiny house to the trailer in this way is taking a huge, possibly fatal risk. Part of the problem with this method is that the screws go in vertically. A vertically oriented Bugle Batten Screw or Hurricane Screw in this example is a very poor method of attaching a tiny house and trailer. Remember that the easiest way to get a screw, nail or bolt to come out, is to take it out the way it went in. It would be better if the batten screw could be installed at an angle to the upward lifting force, thus taking advantage of the shearing strength inherent in the metal of the screw, rather than relying on the thread. Any screw, nail or bolt provide their real strength when they are applied at an angle to the force they are protecting against (think of pinning a tent down with pegs – they always go in on an angle to provide strength). In this case, using a horizontally angled bolt, against the upward lifting forces applied to the tiny house, would be the strongest way of fastening the tiny house to the trailer. Which is exactly what Fred has done. Fred’s Unified Construction Method™ uses ample horizontally oriented bolts with Nyloc nuts that will not vibrate loose. The Method also extends parts of the trailer up through the floor joists, into the stud walls. It’s very strong and very secure. And the glue that holds it all together? Most conventional construction adhesives like Liquid Nails get brittle over time, which matters on tiny houses on wheels. The vibrations from transport may render the glue subject to cracking instead of adhering. Meaning there could be very little connecting the tiny house to the trailer once the glue is fully cured. Fred uses an adhesive with plenty of flexible polymers that retain flexible rubber-like adhesion in high vibration situations so it stays securely fused together. This is why we say that Fred has developed the strongest possible attachment method between tiny house and trailer that exists on the market today. We recommend all tiny house builders use it. Knowledge of weight distributions and material densities are a significant aspect of tiny house building and it takes experience and expertise to make safely towable tiny houses. Especially when it includes heavy off-grid equipment like batteries and solar panels. But conventionally trained builders do not habitually calculate the total weight of their building, so may not be well equipped to do so. A diligent tiny house expert can do these calculations, indeed Fred does them as a matter of course, because tiny houses on wheels are beholden to road rules and subject to on-the-spot weight testing if ever pulled over in transit. And I think we can assume that if a highway patrol officer or VicRoads officer (or equivalent in your state or territory) sees a tiny house being towed, they’re going to be asking questions. Making sure that a tiny house is made within weight limits is crucial for it’s ability to be registered with your local road authority. And if your tiny house is registered (or able to be registered) as a caravan, it ensures it’s categorisation as a caravan in the council’s eyes. The tiny house has to meet the trailer registration standards and national caravan standards found in the VSB1 (Vehicle Standard Bulletin 1), because if it is not officially a ‘caravan’ it could be classified as a building and therefore be subject to building codes and policies. Tasmanian State Government has made this clear in their Tiny Houses Fact Sheet, that stipulates “if [a tiny house on wheels] cannot be registered as a vehicle, then it is a building and the Building Act applies.” Other Australian states and territories may soon follow suit. That all speaks to the question of legality, but greater than that is the question of actual safety. And if you are towing over your weight rating, you’re taking a potentially fatal risk, for yourself, all those around you and for the tiny house movement. Many people who are interested in tiny houses are concerned about how to heat a tiny house in the winter. Which is fair because it’s the focus of tiny house building in the United States and in conventional housing all over the world, as heat retention is a major way of saving energy and reducing carbon emissions, especially in the northern hemisphere. However this should not be the primary focus of tiny house that is subject to hot Australian summers. That’s because, it is easy to heat a tiny house. And it’s easy to retain heat in a tiny house. What is hard is keeping it cool in the summer. Especially if you’re running it off-grid and only using renewable energy. It’s a small space – air can get trapped and heat up quickly. Large windows are nice to look through – but they can let in lots of direct sunlight, heating everything the sunshine touches. Solar panels need to be in direct sunlight – but humans prefer the shade of a tree in the heat of summer. A loft bed is a good use of space – but heat rises, and the air temperature stratifies so that the air in the loft can be 10 degrees C hotter than on the ground floor. So managing the heat in summer is one of the main challenges of tiny house design here in Australia, but following minimum building codes will not necessarily help you do it. If you’re building your tiny house on wheels in a cool climate, conventional building code will stipulate that the house be fitted with bulk insulation in all the walls and in the ceiling, which will keep heat in – in winter and summer. But because your house is tiny, it needs a strong defense against the summer heat, stronger than that allowed for in the National Construction Code. What is needed (in addition to bulk insulation) is a radiant barrier in the walls and in the ceiling. A radiant barrier reflects 95% of radiant heat. In it’s simplest form, it is made of a reflective surface with an air gap in front and behind it. It creates an effect as though the inside of the tiny house is in the shade, even though the outside of the tiny house is under the blazing sun. On a hot day you can imagine how hot the steel roof gets under the sun. But with 95% of that heat being knocked back by a radiant barrier, it’s surprisingly cool in our tiny house. This is helped by the veranda awnings over the windows and the cross ventilation made possible from well placed windows in the loft areas. Here at Fred’s Tiny Houses, we have innovated a successful way of keeping our tiny houses on wheels comfortable all year round without the use of fossil fuels. And we’ve been nominated for 4 international awards for these efforts. We take the best of code and make it better, more applicable to the nuances of tiny house building. In all our tiny houses we build in at least two layers of insulation, one that keeps the summer heat out as well as one that keeps the winter heat in. And we teach you how to do it all yourself in these workshops. So who can build a tiny house on wheels? Professional builders and DIYers alike have to learn the particularities of building a tiny house on wheels in a safe and sustainable way, all of which is at a knowledge frontier because of the relative cultural novelty of building a whole house on a trailer. Ultimately, what is needed is consulting an expert who has done years of research into the different forces that a tiny house on wheels will have to endure, and has figured out the safest ways of securing the house to cope with those forces. Fred has done this research and openly shares his knowledge and building methods to DIYers all over Australia through his workshop series. It is our hope that through the provision of high quality information and continued support, we can protect the tiny house movement by informing all tiny house builders on how to use safe, well researched building techniques that allow the tiny house occupants to feel liberated by their peace of mind as well as their housing choices. But somebody told me that I need a Master Builder! If you‘re still having doubts about your eligibility to build a tiny house on wheels yourself, take heart. The fact is that, so long as it is able to be registered, tiny houses on wheels are not officially buildings, which means that anyone can build them, DIYers and professional builders alike. It is the main reason why the movement has taken off in many countries. Keen DIYers can take on their own build, and frequently do with great success and satisfaction. So if you’re keen and well informed, don’t let a master builder or so-called ‘experts’ take the hammer out of your hand. For the full download of Fred’s Unified Construction Method™, take our nationally renowned workshop series in a location near you – or in a great holiday location! And get a trailer that provides the strongest tiny house-trailer attachment possible. Of course, if you don’t have the time, skills or inclination to build it yourself, we can build it for you. Either to completion or to Lock Up Plus* which means that we do all the structural stuff so that you can DIY the interior and do all the creative bit yourself. And get this – we have a team of certified carpenters and builders who are under Fred’s close instruction on how to make our tiny houses the strongest, safest, most comfortable tiny houses on wheels in Australia, so that you can enjoy that peace of mind. We hope this helps you to liberate yourself through your housing choices. * Lock Up Plus is a shell of your custom designed tiny house. Trailer, walls, roof, insulation, windows and doors are all built to lock up. The ‘Plus’ means that we include electrical wires roughed in, so you can easily run power tools in your new tiny house while you do the internal fit-out. If you’re ready to fast track your build and have us do all the safety stuff for you, talk to Ben about getting a shell built to Lock Up Plus. Call 0421 720 851.